How do you produce affordable for-sale homes in Hawai‘i? 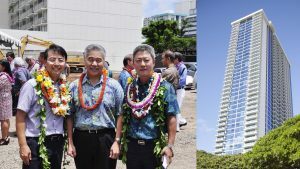 The answer may lie in an idea raised by Governor Ige in his State of the State address to build condominiums on state land with 99-year leases. Bills for such a plan are still being discussed, but the initiative has been applauded for its out-of-the-box approach to the islands’ housing shortage. This issue takes a closer look at progress on affordable housing, homelessness and what it would take to put home ownership within reach of more people. Gov. 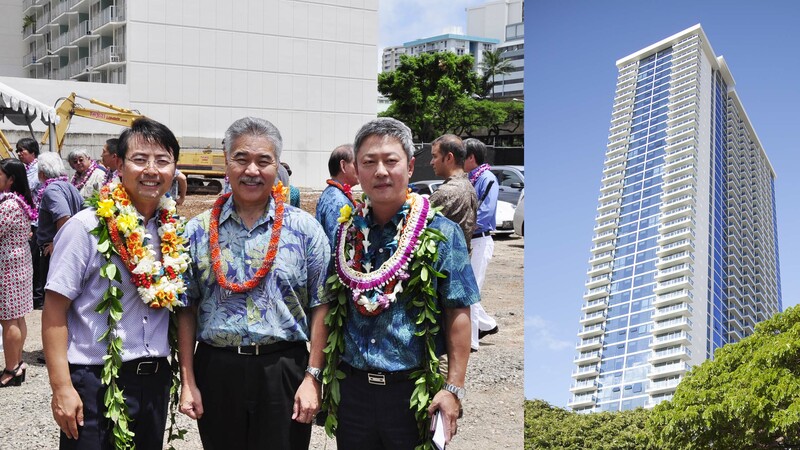 Ige with president Timothy Yi (left) and CEO Simon Kim of SamKoo Corp. at the for-sale Kapiolani Residence tower near Ala Moana Center, built under the state’s 201H affordable housing law. Q. You’ve been working on the state’s affordable housing crunch since the start of your administration. Why do you think building for-sale condominiums on state land with 99-year leases has promise? A. This proposal would help folks who want to be able to buy a unit, not just rent. We’re continuing our momentum in developing affordable rentals, thanks to improved financing tools and legislative funding that make building these projects feasible. The leasehold condos could be a breakthrough in for-sale housing because it gives us a way to develop and keep the price of the units affordable. The buyer isn’t paying for the cost of the land, which developers say adds 20 to 25 percent to the cost of a home. Q. How would this help with the statewide affordable housing shortage? A. Because the state would hold title to the land, we could determine the terms for how it should be resold, with shared appreciation for both the buyer and the state. Those who qualify would agree to resell it to a housing trust or to the Hawai‘i Housing Finance and Development Corporation to allow us to keep the unit affordable. Right now, we can only develop affordable rentals if we provide additional financing support, so we’re limited on the number we can develop. With a for-sale project, the state would provide the land and/or infrastructure to incentivize developers and pass on the cost savings to the buyer. This allows us to increase the affordable inventory and lower prices for homeowners. Q. What signs of progress are you seeing in addressing homelessness statewide? A. We’re seeing positive results every year — in the number of people moving from homelessness into permanent, supportive housing and the collaboration between city, state and federal agencies and service providers. In 2018 alone, we moved over 7,000 people statewide — an average of 584 people a month — into permanent housing. The $30 million ‘Ohana Zones funding has enabled us to expand our range of options, including more emergency shelter space and “bridge” housing. The lieutenant governor is also looking at ways to connect the most chronically homeless on the streets to more medical care and other services. Q. Why are you excited about projects such as the Entrepreneurs Sandbox in Kaka‘ako? A. The Sandbox is a community center for innovation — a public gathering place for creative people to launch a business or for anyone with new ideas to make them a reality. What’s happening in Kaka‘ako is millennials and people of all ages want to enjoy urban living in a walkable, “live, work, play” community. The Sandbox is part of our new tech and innovation economy — a way to bring people together to generate ideas for the future. Q. What is your role as the new co-chair of the national Council of Governors and why did you seek it? A. I wanted our state to have a voice on the council because of our strategic role in the Pacific. The council identifies policy and funding issues related to the Department of Defense, the National Guard, cybersecurity, homeland security and FEMA. As we saw with the 2018 hurricanes and the Kīlauea eruption, we needed a coordinated emergency response in case of a large-scale disaster. Read more in the April Capitol Connection newsletter.